Raccoons, while adorable, cause huge headaches for many business and homeowners. The highly intelligent and adaptable creatures use their dexterous front paws and long fingers to help them forage any food they find on your property – including the waste from your garbage cans. As you can imagine, tipped over garbage cans and torn open garbage bags create quite a mess. In addition to making a mess outside, raccoons become a noisy nightmare when making their den inside of chimneys, attics, and crawlspaces. 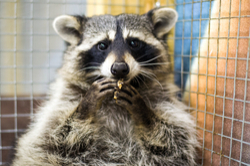 If you suspect you have an unwanted house guest, call the raccoon trapping experts at Critter Control® of Tampa right away. Trap placement – Place your trap in areas you have seen raccoon damage or that you suspect a raccoon may be living. Set the trap on a flat, even surface, making sure it sits steady. Bait the trap with food items such as bread or marshmallows. If you’re setting the trap outside, be aware that it’s possible you will catch another animal- especially when using meat. Size of trap – Raccoons are clever and strong. So, to keep them from breaking out of the trap, you should have one that is made of a sturdy material, like steel. And, because of their size, it’s important that you get a trap they will have no problem walking inside of. A trap that’s at least 12x12x32 is ideal. Because there are specific rules and regulations involved with releasing wild animals, it’s recommended that you contact a professional wildlife removal company at the first signs of a raccoon intrusion. This will help you to avoid any legal repercussions. Hiring the trained technicians at Critter Control® of Tampa will ensure the raccoons are safely and humanely removed, and all entry points are sealed to keep future wildlife from getting back in. We will then thoroughly clean up any messes and repair any damage caused by the animals. This sometimes involves replacing soffit panels, roof vents, attic insulation, etc. There are also many health risks to consider when making an effort to trap wildlife yourself. Although raccoons are not hostile creatures, they will become agitated when cornered or trapped, possibly harming themselves and those around them, or destroying your property even further. And while not all raccoons carry diseases, you don’t want to risk coming in contact with one that could be infected. With so many things to consider, why not leave the raccoon trapping up to the professionals at Critter Control® of Tampa? With over 30 years of experience, we know how to solve your wildlife worries quickly and efficiently. We will begin with a free animal entry inspection of your Tampa home or business. Then, we will comprise a plan that will make sure no crucial steps are missed in the process of returning your home to its original state. For more information, or to get your free estimate, call us today at 813.948.0870.